اصلاح, فرناز, جنوبی, مهدی, فائزی پور, مهدی, عنایتی, علی اکبر, افشارپور, مریم. (1396). کاربرد نانوکریستال سلولز استیله شده در چسب بر پایه سویای اصلاح شده برای تخته لایه. مجله صنایع چوب و کاغذ ایران, 8(1), 79-94. فرناز اصلاح; مهدی جنوبی; مهدی فائزی پور; علی اکبر عنایتی; مریم افشارپور. "کاربرد نانوکریستال سلولز استیله شده در چسب بر پایه سویای اصلاح شده برای تخته لایه". مجله صنایع چوب و کاغذ ایران, 8, 1, 1396, 79-94. اصلاح, فرناز, جنوبی, مهدی, فائزی پور, مهدی, عنایتی, علی اکبر, افشارپور, مریم. (1396). 'کاربرد نانوکریستال سلولز استیله شده در چسب بر پایه سویای اصلاح شده برای تخته لایه', مجله صنایع چوب و کاغذ ایران, 8(1), pp. 79-94. اصلاح, فرناز, جنوبی, مهدی, فائزی پور, مهدی, عنایتی, علی اکبر, افشارپور, مریم. کاربرد نانوکریستال سلولز استیله شده در چسب بر پایه سویای اصلاح شده برای تخته لایه. 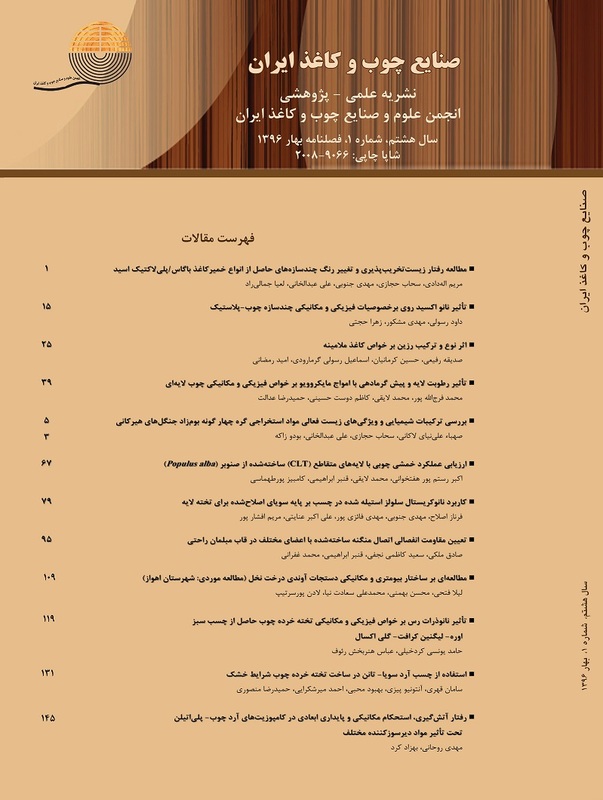 مجله صنایع چوب و کاغذ ایران, 1396; 8(1): 79-94. Van Langenberg, K., Grigsby, W. and Ryan, G., 2010. Green Adhesives: Options for the Australian industry – summary of recent research into green adhesives from renewable materials and identification of those that are closest to commercial uptake. Prepared for Forest & Wood Products Australia. Project number: PNB 158-0910. Sun, X. S., 2005. Soy protein adhesives. Bio-Based Polymers and Composites. Elsevier, Amsterdam, the Netherlands, 327-368. Lambuth, A. L., 1994. Protein Adhesives for Wood. In Handbook of Adhesive Technology, Pizzi, A.;Mittal, K. L., Eds. ; Marcel Dekker, New York. Gao, Q., Qin, Z., Zhang, S. and Li, J., 2013. Preparation of wood adhesives based on soybean meal modified with PEGDA as a crosslinker and viscosity reducer. BioResources, 8(4): 5380-5391. Liu, D., Huihuang, C., Chang, P.R., Wu, Q., Li, K. and Guan, L., 2010. Biomimetic soy protein nanocomposites with calcium carbonate crystalline arrays for use as wood adhesive. Bioresource Technology., 101: 6235–6241. Huang, W.N. and Sun, X., 2000. Adhesive properties of soy proteins modified by urea and guanidine hydrochloride. Journal of the American oil chemists society, 77:101–104. Hettiarachchy, N. S., Kalapathy, U. and Myers, D. J., 1995. Alkali-modified soy protein with improved adhesive and hydrophobic properties. Journal of the American Oil Chemists' Society, 72(12): 1461-1464. Gao, Q., Li, J., Shi, Q.S., Liang, K. and Zhang, X., 2012. Soybean meal –based adhesive reinforced with cellulose nano whiskers. BioResources, 7(4), 5622-5633. Bondeson, D., Mathew, A. and Oksman, K., 2006. Optimization of the isolation of nanocrystals from microcrystalline cellulose by acid hydrolysis. Cellulose, 13(2), 171-180. Chang, Y. R., Lee, H. Y., Chen, K., Chang, C. C., Tsai, D. S., Fu, C. C. and Fann, W., 2008. Mass production and dynamic imaging of fluorescent nanodiamonds. Nature Nanotechnology, 3(5): 284-288. Kaboorani, A., Riedl, B., Blanchet, P., Fellin, M. Hosseiniaei, O. and Wang, S., 2012. Nano crystalline cellulose (CNW): A renewable nano-material for polyvinyl acetate (PVA) adhesive. European Polymer Journal, 48(11): 1829-1837. Angles, M. N. and Dufresne, A., 2001. Plasticized starch/tunicin whiskers nanocomposite materials. 2. Mechanical behavior. Macromolecules, 34(9), 2921-2931. Nogi, M., Abe, K., Handa, K., Nakatsubo, F., Ifuku, S. and Yano, H., 2006. Property enhancement of optically transparent bionanofiber composites by acetylation. Applied Physics Letters, 89: 233123. Jonoobi, M., Harun, J., Mathew, A. P. and Oksman, K., 2010. Mechanical properties of cellulose nanofiber (CNF) reinforced polylactic acid (PLA) prepared by twin-screw extrusion. Composites Science and Technology, 70(12), 1742-1747. Bulota, M., Kreitsmann, K., Hughes, M. and Paltakari, J., 2012. Acetylated microfibrillated cellulose as a toughening agent in poly (lactic acid). Journal of Applied Polymer Science, 126: E449-E458. Segal, L., Creely, J., Martin, A. and Conrad, C., 1959. An empirical method for estimating the degree of crystallinity of native cellulose using the X-ray diffractometer. Textile Research Journal, 29: 786-794. Holzwarth, U. and Gibson, N., 2011. The Scherrer equation versus the 'Debye-Scherrer equation'. Nature Nanotechnology, 6(9):534-534. Annual Book of ASTM Standards., 2004. D906-98, ASTM International, West Conshohocken, PA, 15.06: 1-4. American National Standards Institute. 2004. American National Standard for Hardwood and Decorative Plywood, Sec. 4.4: Cyclic-Boil Shear Test. ANSI/HPVA Hp-1. Khalil, H.P.A., Ismail, H., Rozman, H.D., Ahmad, M.N. 2001. The effect of acetylation on interfacial shear strength between plant fiber and various matrices. Eur Polym J 37(5):1037–1045. Jonoobi, M., Harun, J., Shakeri, A., Misra, M.and Oksman, K., 2009. Chemical composition, crystallinity and thermal degradation of bleached and unbleac kenaf bast (Hibiscus cannabinus) pulp and nanofibers. BioResources, 4(2):626–639. Cetin, N.S., Tingaut, P., Özmen, N., Henry, N., Harper, D., Dadmun, M. and Sebe, G., 2009. Acetylation of cellulose nanowhiskers with vinyl acetate under moderate conditions. Macromolecular Bioscience, 9: 997-1003. Ifuku, S., Nogi, M., Abe, K., Handa, K., Nakatsubo, F. and Yano, H., 2007. Surface modification of bacterial cellulose nanofibers for property enhancement of optically transparent composites: dependence on acetyl-group DS. Biomacromolecules, 8(6): 1973-1978. Huang, J. and Li, K., 2008. A new soy flour-based adhesive for making interior type II plywood. Journal of the American Oil Chemists' Society, 85:63–70. Nakanshi, K., Solomon. P.H. Infrared absorption spectroscopy. USA: Holden- Day, Inc.; 1977 (p. 8–45). Silverstein, R.M. and Webster, F.X., 1997. Infrared spectrometry. In: Spectrometric identification of organic compounds, 6th edn. John Wiley & Sons, Inc., New York, pp 97–99. Zhong, Z.K., Sun, X.S., Wang, D.H. and Ratto, J.A., 2003. Wet strength and water resistance of modified soy protein adhesives and effects of drying treatments. Journal of Polymers and the Environment, 11(4): 137-144. Jackson, M. and Mantsch, H. H., 1995. The use and misuse of FTIR spectroscopy in the determination of protein structure. Critical reviews in biochemistry and molecular biology, 30(2), 95-120. Chiang, Y. S., Gelfand, T. I., Kister, A. E. and Gelfand, I. M., 2007. New classification of supersecondary structures of sandwich‐like proteins uncovers strict patterns of strand assemblage. Proteins: Structure, Function, and Bioinformatics, 68(4), 915-921. Lin, Q., Chen, N., Bian, L. and Fan, M., 2012. Development and mechanism characterization of high performance soy-based bio-adhesives. International journal of adhesion and adhesives, 34: 11-16. Frihart, C.R., Birkeland, M.J., Allen, A.J. and Wescott, J.M., 2010. Soy Adhesives that Can Form Durable Bonds for Plywood, Laminated Wood Flooring, and Particleboard, Proceedings of the International Convention of Society of Wood Science and Technology and United Nations Economic Commission for Europe – Timber Committee October 11-14, Geneva, Switzerland. Guerra-Hernandez, E., Corzo, N. and Garcia-Villanova, B., 1999. Maillard Reaction Evaluation by Furosine Determination during Infant Cereal Processing. Journal of Cereal Science, 29: 171–176.